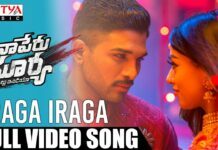 Watch Ente Peru Surya Ente Veedu India Theatrical Trailer Malayalam version of Naa Peru Surya Naa Illu India. It is an original 2018 Telugu action film written and directed by Vyakkantam Vamsi, produced by Shirisha and Sridhar Lgadapati under the Ramlakshmi Cine Creation banner. 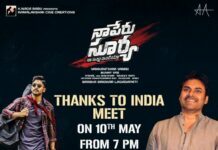 Ente Peru Surya Ente Veedu India film features Allu Arjun and Anu Emmanuel in the lead roles while Arjun and R. Sarathkumar play supporting roles. The soundtrack for the movie is composed by Vishal-Shekhar. The movie is all set to release on 4th May 2018. Recently, the pre-release event of the film was organized on April 29th at Gachibowli Stadium, Hyderabad.